God hardwired you-yes, you-for this. I'm talking about sharing Jesus with others. What if I told you that God has created you to bring glory to himself by sharing Jesus with others, and that you don't need years of training to obey what he already made you to do? Just you, Jesus, and others-in conversations that matter. 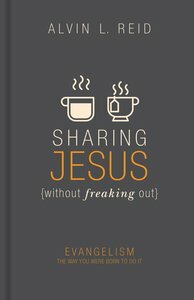 About "Sharing Jesus Without Freaking Out"
Alvin L. Reid (Ph.D., Southwestern Baptist Theological Seminary) is professor of evangelism and the Bailey Smith Chair of Evangelism at Southeastern Baptist Theological Seminary. He is the author of seven books, including Radically Unchurched, Raising the Bar, Introduction to Evangelism, Evangelism for a Changing World and most recently The Convergent Church with Mark Liederbach.